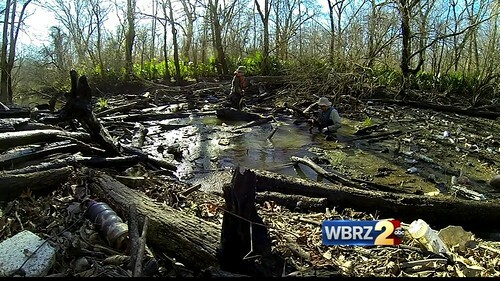 So, Friday afternoon on my way to pick up some wood (go figure), I got a call from a guy at WBRZ who thought our work was a story that would work well for a spot on the news. We verified the plan for the morning, and all was set for a slightly different day than most we’ve had out there. After we’d all arrived at Highland Road Park and readied the canoes and gear, we headed off down the bayou in three canoes. Two with the three of us and all the gear, and a third canoe towed behind with the expensive camera and such. (The red canoe in the news video is the towed dry canoe.) It was rather chilly at first, but paddling soon took care of the chill. We encountered no problems on the 54-minute leisurely paddle down to Blockage #15. 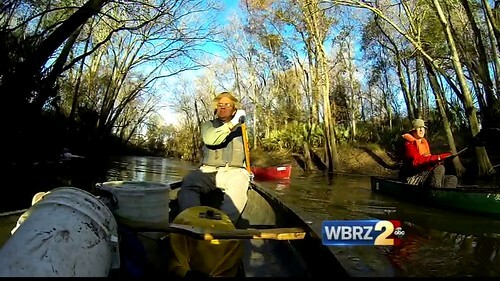 We weren’t there very long when another canoe appeared coming down the bayou. Reinforcements! Woo-hoo! 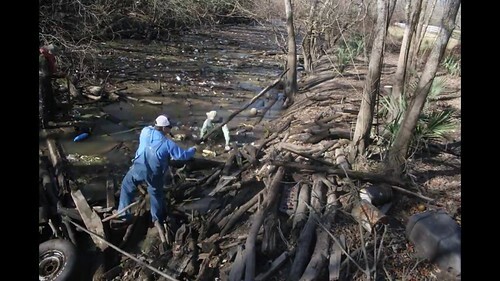 He joined right in and started tossing logs, buckets,… even *cars*, right out of the bayou. (We’ll do a Canoemaran run to collect all the large objects once we’re through.) The discard pile on shore was growing almost as fast as the log fort on winch island. We left the main part of the cork in so no logs would make their way downstream. (There are enough there already without postponing some of the ones here until later.) The water flowing through was considerable. 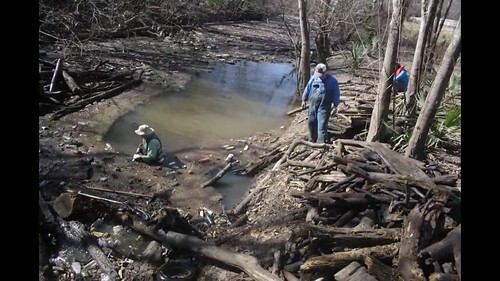 We don’t recall ever hearing the term “babbling bayou”, but that’s certainly what we were experiencing at the cork, where the water dropped several inches in mere feet. Eventually, our reinforcements had to call it a day, and after another hour or so of working more and more upstream, we decided to call it a day as well. There’s no telling exactly what fraction of completion we reached, but it was certainly farther than we’d expected. There’s *lots* more out there, and the litter is more and more accessible as the work continues. Next weekend should be great. 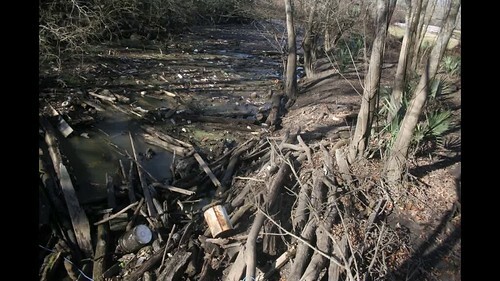 With everything shifting around as we worked upstream, the final shot in the time lapse at the top of this report actually looks “worse” than earlier in the day. It certainly was not, but still, let’s end this with a frame from the video with, perhaps, the most water visible. Pillarboxed images are frames from Mike Tilley’s time lapse, linked at the top. 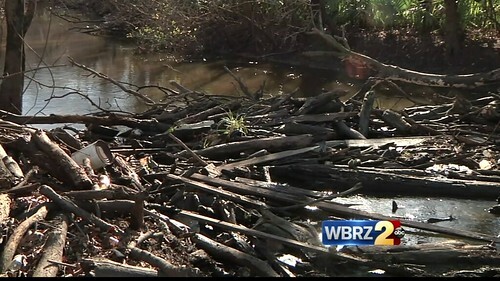 WBRZ-labeled images are frames from the WBRZ news story, linked from the first WBRZ image above.